She was supposed to be me wife's dog--something to help her cope with the death of her grandmother. I had been asking my wife if we could get a dog for years: we had a fenced in back yard, and our girls (then 4 and 9) had both been wanting one. When we got our little mixed breed, Australian Shepherd + something home, she was barely 8 weeks old. 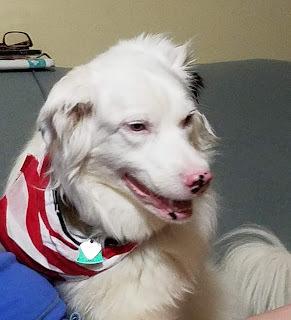 She was full of energy and as girly-looking as possible: 95% white, with just a few black spots, a pink nose, and the weird "ghost eyes" of the Australian Shepherd breed. My three girls gave her the girliest name possible: Sunshine Blossom. Those first few days were rough. Sunnie, as we called her, didn't want to be away from us. She cried and barked at night in her training crate, to the point no one was getting any sleep. I laid on the floor in our then-carpeted living room, beside the crate, putting a couple fingers inside for the little puppy to lick on. I know that probably wasn't the best move to make, but it calmed Sunnie, let us all sleep, and I think, indelibly imprinted her on me as surely as if she was a baby duckling and I had been there when she hatched. For her nine years of life, Sunnie followed me everywhere around the house and never wanted to leave my side. I fed her in the mornings, took her outside, and (until the last few years of her life, when my teenager began helping with doggy duties) fed her and took her outside in the evenings. I attempted to train her, with poor results, both due to my her innate stubborness, and inexperience with dogs. I took her to the vet, often holding her in my lap as she shivered with anticipatory fear of the annual shots each visit ended with. Sunnie wasn't my first dog. My first dog was an Australian Cattle Dog-mix, named Missy, that my parents had when I was a toddler. Missy was attached to me as well, and I'm told they eventually had to give her to my mother's mother as the dog would knock me down, push me into cabinets and otherwise inadvertently hurt me as she tried to lick on me and play with me. I don't remember this. What I do remember is the poor, dirty, outside dog at my Mammaw's when I was growing up. Missing an eye (after having gotten out one day and getting struck by a car), Missy was always eager to see me when I went to my Mammaw's house. When I finally asked why around age 7, I then learned she had once been my dog. I felt terrible, and often feel guilty even now that I didn't spend more time with her. My second dog was a tiny Dachsund, a "weiner dog", who's name I can't recall. I had this little guy for two weeks when I was about 4 years old. My dad became frustrated at his inability to paper train the little peeing machine, and he was given away to another family. My third dog, Mark, was a miniature schnauzer--the "Monopoly dog", that I was surprised with on my 5th birthday. He was filled with energy and constantly jumped all over me. He also hated cats, and chased my mother's Pomeranian, Tammy, around the yard constantly. My parents had chosen Mark for me, since a local TV clown "Presto" had a similar dog and I was so fascinated it. But, as my parents couldn't control Mark, presto, he vanished from my life, only a few months after I got him. My fourth dog, Buttons, was a Pomeranian like my mother's dog. He too was full of energy and was always climbing all over me, licking me and wanting to play. He also had a propensity for chewing--furniture was his favorite. He signed his deportation order one weekend while we were out. We came back and found that he had been trying to escape the laundry room my father had locked him in (to spare the furniture further chew marks). In our absence, he had chewed a hole through the drywall and was working on gnawing a hole on the other side, so he could escape to the basement. Buttons was sent away. My parents divorced shortly thereafter, and Tammy became my dog. Some time after the divorce, after my father got custody of me, he decided that keeping Tammy in an apartment all day wasn't fair to her. I still remember taking her to the people we had given Buttons to a few years prior. I didn't have any more dogs for many years. In the late 1980s, after high school, I got my then-girlfriend a dog: a husky mix she named Britta. The little puppy became very attached to me, angering my girlfriend, and I had to get her another dog. Britta became unofficially mine, but lived with the girlfriend, who lived with her grandparents in a big house with a field and woods behind it. 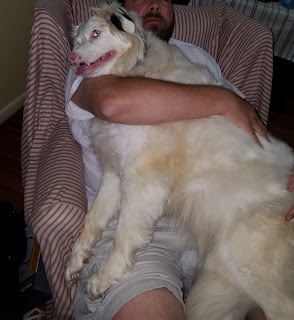 Despite breaking up several times, sometimes for months, every time I went back to that house, Britta remembered me and came running, excited and jumping all over me. Sunnie, my wife's dog, out-attached every other dog I've ever had. I often called her my shadow, or my own personal groupie. I don't know how I formed this bond with her, but my wife and kids grudgingly acknowledged it. Sunnie became my dog. At the shelter where we got her, eight week-old Sunnie was described as being blind and deaf. We found neither to be true, testing her at the shelter before we adopted her. She was the last of her little of "double merle" collie-mixes. Later, when she passed 80 pounds, we guessed that she wasn't part-Collie, after all, but part Pyrenees (and Australian Shepherd). We didn't care that her near-albino, all-white state probably meant she had congenital defects. We all fell in love with the feisty little ball of fur the first day we saw her. As she grew, Sunnie turned into a big, fluffy dog who, despite her size, always wanted to get up in my lap, but who, due to an off-center pupil in her left eye, was unable to follow me down the basement stairs--instead laying in the living room, above wherever I was in the basement, occasionally growling to let me know she was there. She was great fun, even if I was often the only one allowed to pet her when I was in the room. She loved chasing her little silver, Radio Control car, or her laser pointer dot. She amused us all nearly every day. Sunnie wasn't perfect. In addition to being a notorious chow hound who I often declared would eat herself to death if given the chance, Sunnie was more than attached to me: she was possessive. Often, she would nip, or even bite at anyone trying to pet her while she sprawled across my lap. She laid on the floor beside the bed, beside me, at night. She would pull my socks out of the laundry hamper and hide them with her toys under the bed--when she wasn't using them as pillows. It often seemed like an unhealthy attachment my dog had for me. Several years ago, Sunnie lost her vision due to what we later learned was a thyroid problem. Our goofy, always happy dog who loved nothing more than running back and forth in our big yard (and food), suddenly became a much more timid animal. She adapted well, but never regained the confidence to run in her yard again. I would still indulge her in wrestling matches, but a great deal of her exercise evaporated with her vision. They were sad times, particularly when we'd give in to her daily begging for table scraps, which she had difficulty finding on the floor where we dropped them. Over the past year, Sunnie developed a compulsion for licking herself. The veterinarian prescribed Prozac, and while it did calm her and end her nipping, it didn't solve the bouts of incessant licking. We did our best to stop this behavior, scolding her, or squirting her with a bottle. I almost had her trained to stop this unhealthy behavior: snapping my fingers twice, rapidly (something which worked about half the time). We declined further medication, not wanting to have our dog too drugged when she was only 8 years old. This past weekend though, Sunnie's system finally had enough. She began to vomit up her food on Sunday--something she often did when she got hot. We cooled her down, hosed her down, and gave her own fan while we confined our beloved yakster in the kitchen as we always did when she was sick. I made the decision to take her to the vet the following morning. Monday, July 30th, I awoke to a horrible sight. Sunnie had begun throwing up feces. I knew from my reading this was a sign of an intestinal blockage. It meant she had to go to the vet--right away. We quickly carried her outside--she was too weak to even stand--and hosed her down to cool her off. I tried to pour some water in her open mouth, but she couldn't even drink it. As I sat with my beloved, overly-girly dog, she began to have problems breathing. I knew she wasn't going to make it to the vet. I laid down on the wet ground beside her, and tried to comfort her. She began to have leg spasms. Her breathing turned very shallow. She gasped several times as I petted her and told my best friend goodbye. Then her breathing stopped and she passed, her blind eyes staring forward blankly. My best friend was gone. Farewell, Sunnie. With no insult to any dog I've owned before, you were the best friend I ever had. This is the best I can do with words to tell you how much I'll miss you, and how much I loved you. I hope you realized that when you were still here. I'm locking all comments on this thread. No words can make me feel better after this loss. I've posted this story not for consolations but in tribute to my best friend.